“We have made good on the promise delivered at SHOT Show, to provide our customers with a quality product at a competitive price by the second quarter of this year,” Thomas McCrossin, CEO of Kalashnikov USA, said in a press release Tuesday. McCrossin was referring to the company’s pledge made in January, at the world’s biggest convention of arms industry professionals. Held annually in Las Vegas, Nevada, the SHOT (Shooting, Hunting and Outdoor Trade) Show draws over 1,600 exhibitors and 65,000 attendees from 100 countries, and is not open to the public. Kalashnikov USA was originally established as an importer and licensed conversion specialist for the Russian-made weapons. The company had to rethink its operations in July 2014, after the White House’s sanctions targeting Russia for its alleged involvement in the Ukrainian conflict. Under the slogan “Russian heritage, American innovation,” Kalashnikov USA says it wants to improve on Russian designs with US manufacturing techniques such as computer-aided carving (CNC). US-made weapons will have features like a nitrocarburized case hardening on barrels and chambers to extend life and provide a high corrosion resistance, and threaded barrels for muzzle breaks and suppressor systems. 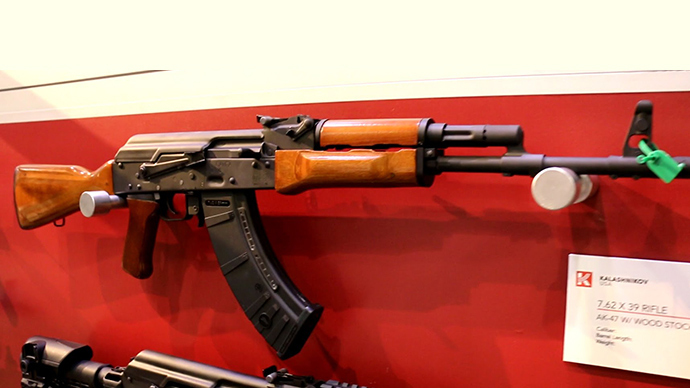 This is the first time official Kalashnikov brand weapons have been produced in the United States. “Our customers will be pleased with the quality of our American weapons and our new designs,” said Bill Silver, VP of sales for Kalashnikov USA. Though the company will not be selling the original AK-47, the rifles and shotguns currently available are clearly descended from the iconic weapon. Designed during WW2 by tank mechanic Mikhail Kalashnikov, and developed by a Soviet engineering team, the AK-47 changed infantry warfare and remains in widespread use around the world almost 70 years later. The AK (which stands for Avtomat Kalashnikova) was designed for firefights at close quarters in the harsh Russian climate. It can be assembled by a person with no military training, is fired by simply pointing at a target, and it can be easily looked after without a cleaning kit. It does not jam by itself (due to the generous allowances between moving parts, which also explain its mediocre accuracy at longer ranges) and it does not stop functioning in any weather conditions.